MTM® is used for reducing iron, maganese and hydrogen sulfide from water supplies. MTM® is a granular manganese dioxide filtering media used for reducing iron, manganese and hydrogen sulfide from water. Its active surface coating oxidizes and precipitates soluble iron and manganese. Hydrogen sulfide is oxidized to a sulfur. The precipitates are filtered out in the granular bed and removed by backwashing. 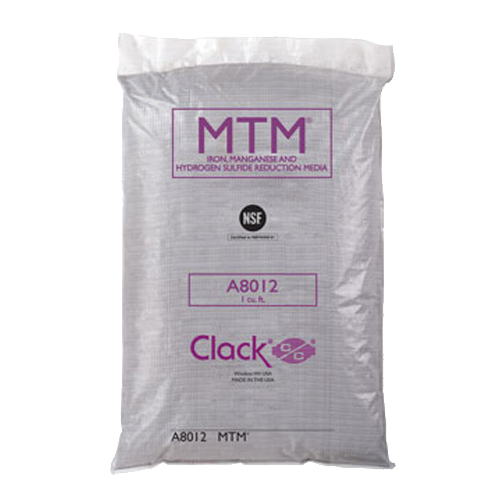 MTM® consists of a light weight granular core with a coating of manganese dioxide. The coating provides an example of contact filtration where the media itself provides the oxidizing potential. This allows for a much broader range of operation than many other iron removal medias. A pH level as low as 6.2 can be treated. Dissolved oxygen is not essential. The media’s light weight reduces backwash water requirements. When the oxidizing power of MTM(r) is reduced, the bed has to be regenerated with a weak solution of potassium permanganate (KmnO4), thus restoring its oxidizing capacity. A regenerating solution of 1112 to 2 ounces (dry weight) of potassium permanganate per cubic foot is sufficient for normal regeneration. Upon start-up a new bed should be backwashed and caution taken to insure that the lightweight media is not backwashed to drain. A new bed should be regenerated the evening of installation. Operating the filter after its oxidizing capacity is exhausted will reduce its service life and may cause staining. MTM® requires either intermittent or continuous regeneration to maintain its oxidizing capacity. A solution of potassium permanganate (or chlorine then potassium permanganate) can be pre-fed to maintain capacity. In the latter case, he manganese dioxide coating acts as a catalyst to enhance the oxidation reaction and as a buffer to reduce any excess potassium permanganate concentration and prevent it from entering the service lines. Bulk Density: 27 lbs./cu. ft.
Backwash flow rate: 8-10 gpm per sq. ft.
Regenerant dosage: 1 ½-2 oz. of KMnO4 by weight per cu. ft.